Most methodological fields undertake regular critical reflections to ensure rigorous research and publication practices, and, consequently, acceptance in their domain. 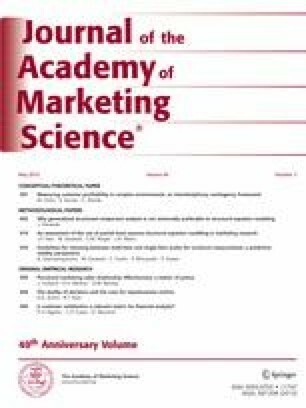 Interestingly, relatively little attention has been paid to assessing the use of partial least squares structural equation modeling (PLS-SEM) in marketing research—despite its increasing popularity in recent years. To fill this gap, we conducted an extensive search in the 30 top ranked marketing journals that allowed us to identify 204 PLS-SEM applications published in a 30-year period (1981 to 2010). A critical analysis of these articles addresses, amongst others, the following key methodological issues: reasons for using PLS-SEM, data and model characteristics, outer and inner model evaluations, and reporting. We also give an overview of the interdependencies between researchers’ choices, identify potential problem areas, and discuss their implications. On the basis of our findings, we provide comprehensive guidelines to aid researchers in avoiding common pitfalls in PLS-SEM use. This study is important for researchers and practitioners, as PLS-SEM requires several critical choices that, if not made correctly, can lead to improper findings, interpretations, and conclusions. The authors would like to thank three anonymous reviewers, Jörg Henseler (University of Nijmegen), and Edward E. Rigdon (Georgia State University) for their helpful remarks on earlier versions of this article. Ringle, C., Wende, S., & Will, A. (2005). SmartPLS 2.0 (Beta). Hamburg, (www.smartpls.de).